U.S. Senate Minority Leader Mitch McConnell, right, and his Democratic opponent, Kentucky Secretary of State Alison Lundergan Grimes, rehearsed with host Bill Goodman before their appearance on Monday on “Kentucky Tonight,” live from KET studios in Lexington, Kentucky. 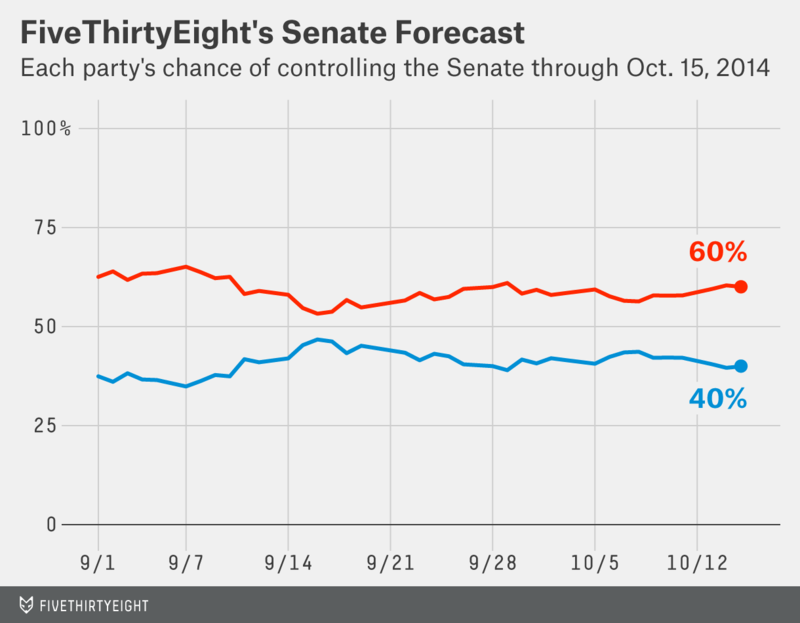 According to the latest FiveThirtyEight Senate forecast, Republicans have about a 60 percent chance of taking control of the Senate. The GOP’s prospects have stayed relatively consistent over the last month, never dropping below 53 percent or rising above 65 percent. How is that possible, even as some other models have seen Republican chances climb higher and higher? 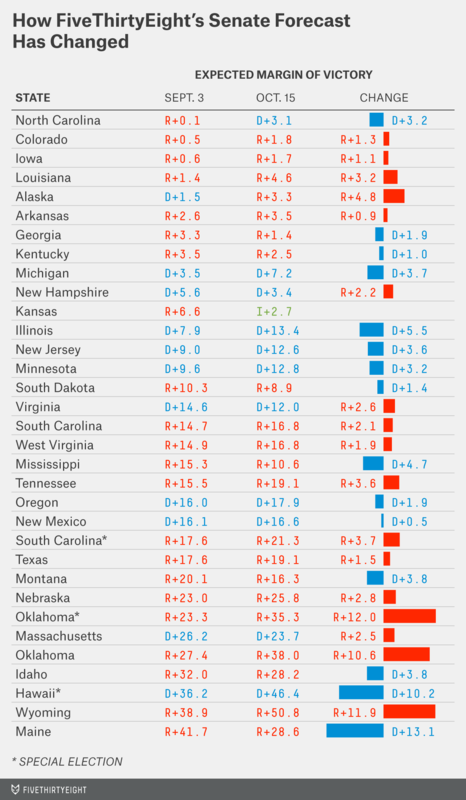 The FiveThirtyEight model is relatively conservative: It takes more evidence to convince the model a race has shifted and more evidence to convince it a state is totally out of play. The model views a larger group of states as competitive compared to other forecasts. So movement in the more marginal battleground states — the Democrat solidifying his lead in Michigan, or the Republican pulling away in Kentucky, for example — matters more. If you consider those states as mostly out of play, the favorites improving their position there won’t affect your overall outlook as much. Looking at FiveThirtyEight’s adjusted polling average since we launched our forecast on Sept. 2, some marquee races have clearly shifted towards Republicans: Colorado, Iowa, Alaska and Louisiana. But other battleground states have moved toward Democrats: Georgia, Kansas, North Carolina and Michigan. These shifts have largely canceled each other out. In Colorado, Republican Cory Gardner was up just 0.5 percentage points on Sept. 2. He’s ahead by 1.8 percentage points right now. On Wednesday, CNN released a survey that had him up 50 percent to 46 percent. That’s now the eighth of the last nine non-partisan sponsored polls in which Gardner led Democratic Sen. Mark Udall. Colorado is close, but even Udall’s own polling has shifted towards Gardner over the past 40 days. Joni Ernst, the Republican candidate for Senate in Iowa, was leading Democrat Bruce Braley by 0.6 percentage points on Sept. 2. She’s up 1.7 percentage points now. On Wednesday, Quinnipiac University put Ernst up 2 percentage points, and Suffolk gave her a 4-point advantage. The trend is clear. Republican Dan Sullivan was trailing by 1.5 percentage points in Alaska when we launched our forecast, but he’s now up 3.3 points over Democratic Sen. Mark Begich. Sullivan was ahead 48 percent to 45 percent in a Rasmussen Reports survey released earlier this week — the ninth consecutive non-partisan sponsored poll in which Sullivan led by at least 2 percentage points. In Louisiana, Republican Bill Cassidy was up 1.4 percentage points in a probable December runoff against Democratic Sen. Mary Landrieu. He has expanded his lead to 4.6 percentage points. That average includes a new Rasmussen Reports poll, which found him up 52 percent to 43 percent. It marks the fifth consecutive poll with Cassidy up at least 3 percentage points in the runoff. Republicans have also gained in New Hampshire, as my colleague Nate Silver detailed on Tuesday, but Republican Scott brown is still an underdog. Democrat Michelle Nunn appears to be taking advantage of Georgia’s changing demographics and Republican David Perdue’s views on outsourcing. She’s down only 1.4 percentage points — compared to 3.3 points on Sept. 2. On Wednesday, she jumped to her first lead in a poll since our forecast launched; SurveyUSA showed her leading Perdue 48 percent to 45 percent. In Kansas, independent Greg Orman has gone from being down 6.6 percentage points in a three-way race with Republican Sen. Pat Roberts and Democrat Chad Taylor to being up 2.2 percentage points in a one-on-one matchup with Roberts (thanks to Taylor dropping out of the race). Even as Roberts has seen a comeback in the polling since mid-September, Orman is in a much better position now than when our forecast launched. In North Carolina, Democratic Sen. Kay Hagan was down 0.1 percentage points in the beginning of September and is now leading Republican Thom Tillis by 3.1 points. She was up 44 percent to 41 percent in a SurveyUSA poll released on Monday. In Michigan, Democrat Gary Peters expanded his lead from 3.5 to 7.2 percentage points over Republican Terri Lynn Land. As I wrote earlier this month, this race is pretty much over. Republicans may have also lost some ground in Kentucky and South Dakota, but they remain clear favorites for now. State by state, there’s been a good deal of movement; add it all together, and — in our model’s reckoning — the aggregate Senate picture looks the same as it did a month and a half ago.